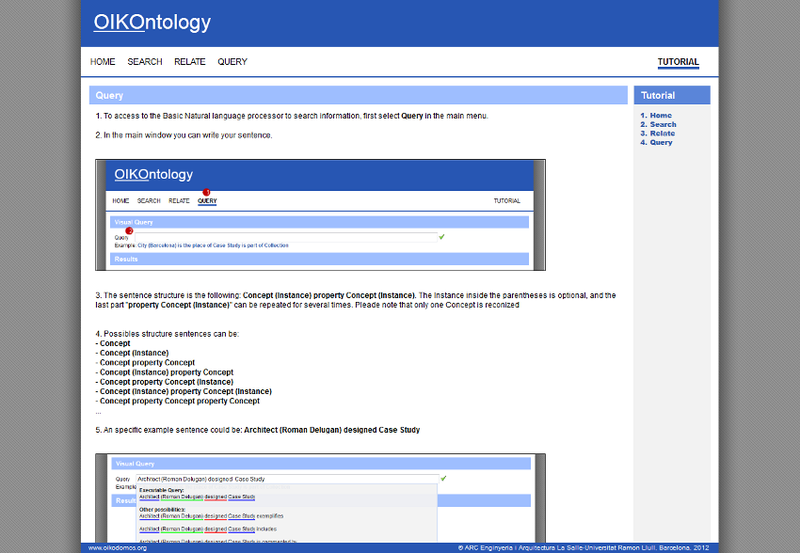 OIKOntology is a Linked Data browser which enables end-user exploration and data querying of the databases of the OIKODOMOS Virtual Campus . 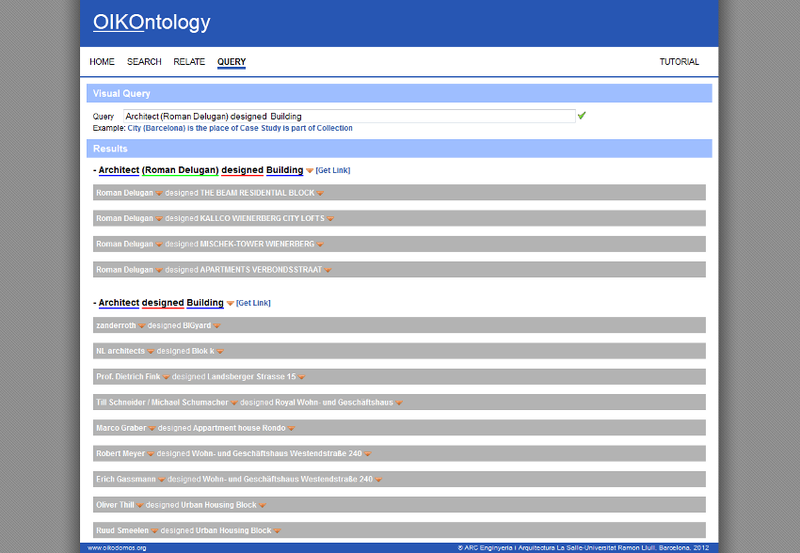 There are three separated databases whose contents have been translated onto an ontology in order to facilitate integrated access to the data: OIKODOMOS Workspaces , OIKODOMOS Case Repository and OIKOpedia. With these semantic-based tools, external users who did not participate in the activities can have easy access to the contents of the databases. The search input is a single term. Instances of the terms included in the ontology are retrieved by means of a suggest drop-down list. The characters introduced in the input box are matched with the properties of the instances and a list of matches and their corresponding types is returned. The results are displayed in two ways: as a list and as a graph representation. The search inputs are two terms included in the ontology which are retrieved by means of a suggest drop-down list. The characters introduced in the input box are matched with the properties of the instances and a list of matches and their corresponding types is returned. The search returns all the terms which are nodes in the paths connecting both input terms. Example: What has “flexibility” to do with “housing”? 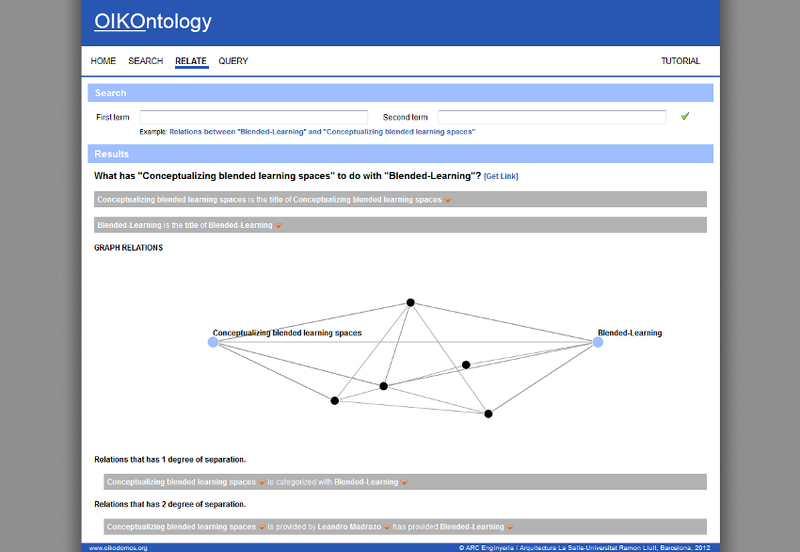 This is a syntactic search guided by the ontology structure. The input is a phrase which is built with two elements: words and properties. 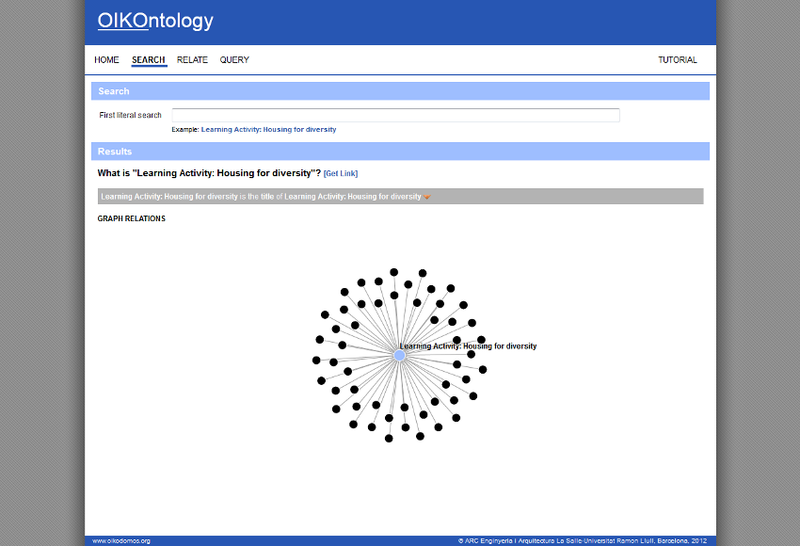 Words are ontology classes which are connected by properties. The query returns phrases with the same structure as the search input. After each word an (instance) of the class can be provided. Example: Which architects have designed buildings located in the city (Barcelona)? This environment supports project-based learning activities, such as the development of a project -architectural and/or urban- in a collaborative manner. It facilitates the collaboration among distant learners, carrying out joint learning activities in different settings, physical and virtual: design studios, seminars and courses. This is the knowledge base of OIKODOMOS project. It contains the topics and concepts studied in the Virtual Campus of OIKODOMOS. Each entry includes the description of the concepts, the cases of study which illustrate them, comments of readers, and references. The entries are in multiple languages. 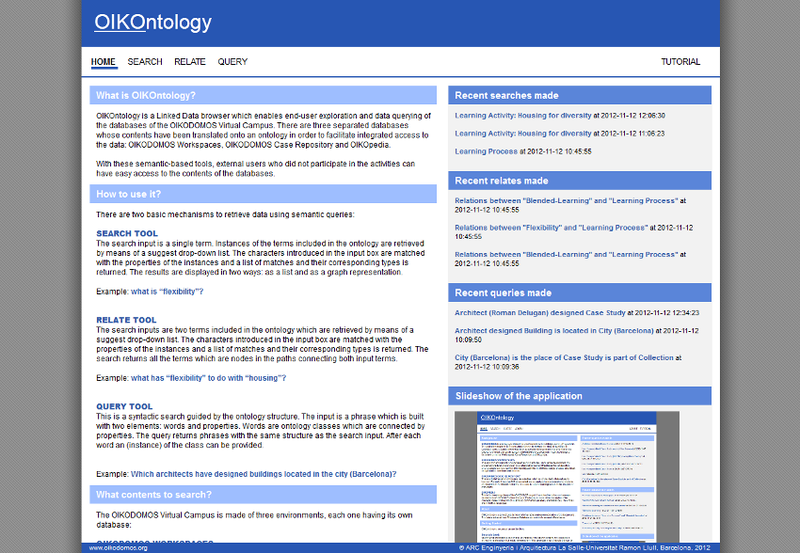 OIKODOMOS is a pedagogic research project financed by the Lifelong Learning Programme. The goal of the project is to create a virtual campus to promote the study of dwelling at a European scale. A digital platform has been specifically developed and implemented for the Oikodomos Virtual Campus to support a blended-learning pedagogic model. 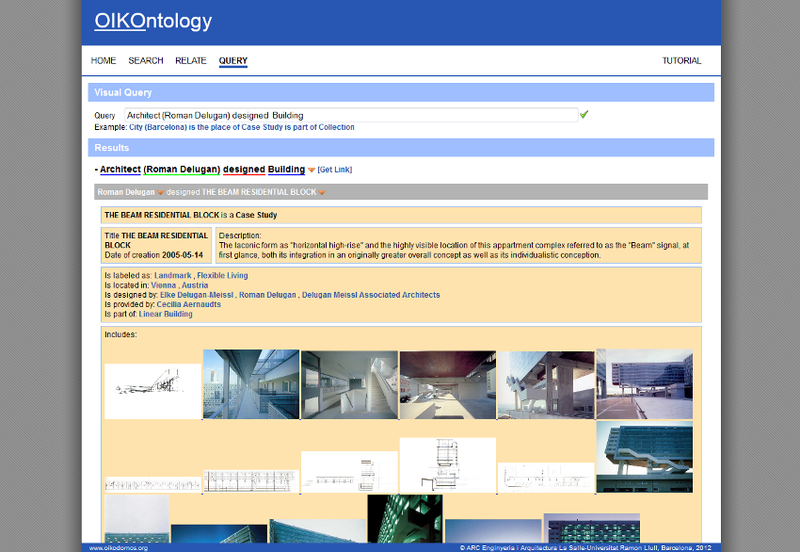 It consists of three environments: Workspaces, Case Repository and Oikopedia.